Manufacturers have an opportunity to train their Sales, Marketing and CatMan teams and build the skills in understanding retail strategy and the retailer’s Shoppers, analyzing and interpreting data, and developing fact-based presentations with logic and flow for better storytelling for their retail customers. 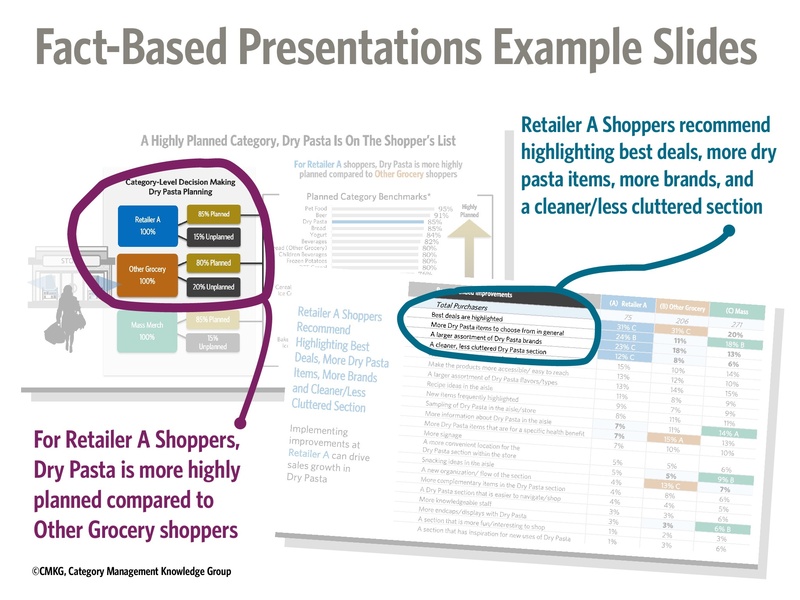 Focus on overall category management and retail strategy, understanding the retailer’s Shoppers, and applying these perspectives to your analysis and presentations. Review and define the most important metrics for each of YOUR data sources based on which data sources (e.g. Shopper, POS, retail measurement, panel data). Shopper data is recommended strongly. Hands-on, customized examples, exercises, and workshops focused on drilling down through basic data to draw insights and identify opportunities. Use a SWOT analysis to record the most important observations from each data source. The customized case study uses a category example from a retailer, where teams will be responsible for identifying the biggest growth opportunities for the retailer. Focus on presentation skills training, including PowerPoint tips and presentation development. 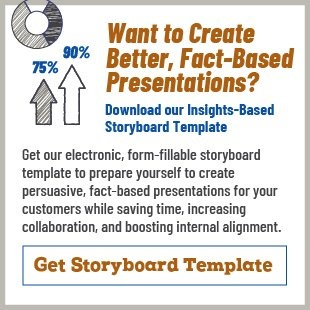 Review and outline a 5-step process to develop fact-based presentations. Introduce a Slide Design Checklist for creating slides that have relevance and value. Work in small groups throughout the day, including one-on-one facilitator coaching, to ultimately develop a fact-based presentation based on Day 1’s case study analysis. Each group presents their fact-based presentation to their peers and a panel with time for feedback after each presentation and a peer vote to identify the best presentation. and what does GOOD look like? This is a question we are often asked and one that is easily answered. Fact-based presentations start with data and facts that guide the presentation and provide the viewer with factual information about the situation, product or service being presented, along with a recommended action from those facts. Become significantly more effective at selling with facts, not opinions or claims. A well-developed, fact-based presentation is your best selling tool but does require additional work. The result of your work presents a much more persuasive story because of the supporting data and facts you include. Rather than spending time disputing your claims, you can discuss and analyze how the facts present opportunities for your audience. Have a high-stakes presentation in the near future? After completing training on fact-based presentations, you’ll have the knowledge and skills to develop and deliver more compelling presentations with a higher likelihood of persuasion. However, you may still worry whether your presentation is as effective as possible when the stakes are high. If you have an upcoming presentation, we can help with a complete fact-based review including suggestions and feedback on where to make adjustments for the highest impact. Email sue@cmkg.org for more information or to get your presentation ready for your upcoming meeting. Assess where your organization and Retailers are in the category management continuum. Improve terminology, understand calculations, and learn how to interpret some of the key metrics used in your business. Develop logic and flow in a fact-based sales presentation. Create effective PowerPoint slides that have meaning, purpose and portray the most important parts of your presentation. *Training session is suggested as a 2-day program but may be condensed to a single- or half-day program with modifications to the content and learning outcomes. Category management presentations should have logic and flow and be audience-focused. Need help with your presentation skills? Consider the Manufacturer program above when it comes to creating manufacturer sales presentations that are persuasive for retail customers. Are you a CMA Member? CMKG hosted a Fact-Based Sales Presentation webinar for members that you can access through their Training & Education resources. Note: You will need to be logged into the site to view.